One of the post important aspects of running your own jewellery business is presentation. When a customer orders a piece of jewellery, it should be presented in a way that makes them feel special and your packaging should reflect this. I have chosen purple/lilac and black as my packaging colours. I carefully wrap my jewellery in lilac tissue paper, the package is then tied with a purple silk ribbon, with Michelle's Handcrafted Jewellery printed on it and then it's all placed in a purple organza gift bag. 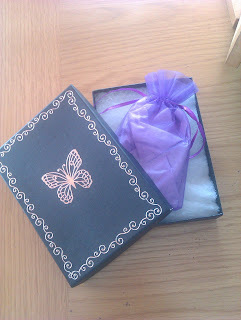 Wedding jewellery is sent in a black box, which I will have decorated with silver embellishments. I love butterflies so you will come across a butterfly at some point, when you received your jewellery from me. The earrings are placed on earring cards and I always include a business card, which is a gentle reminder, to my customers, letting them know where they got that particular item from. Last, but not least, each customer will receive a handwritten note from me, thanking them for their custom. Making the jewellery is lots of fun, packaging it all up, makes me feel like I'm wrapping presents for Christmas and I enjoy wrapping presents, I enjoy my work from start to finish, what more could I ask for.